The Tweaker is a studio grade full parametric EQ / Booster features Independent Level, Filter, Q and Frequency controls that let you preamplifying / equalizing signals from your bass, guitar, microphone or synth in virtually any way you like. Moreover the Tweaker can be used for tone correction, eliminating muddiness, acoustic feedback and resonance frequencies in speaker or monitor systems by suppressing selected frequencies at a wide or narrow bandwidth, retaining much of your instruments sonic signature. 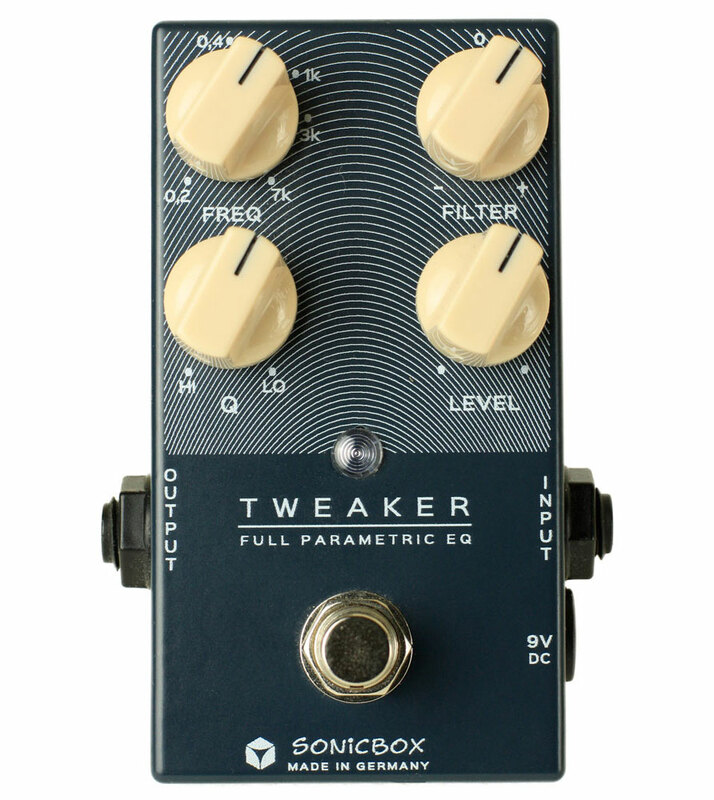 Having the Tweaker before or after your Dirt-Box shape your distortion sounds in radical ways, emphasize or de-emphasize frequencies of your choice. It is acceptable to use extreme Q and Filter settings for creative work, especially to produce special effects. Q - sets the equalized frequency range to either wide - “LO” or narrow - “HI”. As the knob is turned to the left the frequency range becomes narrower, so only those frequencies in the immediate vicinity of the center frequency will be boosted or cut. 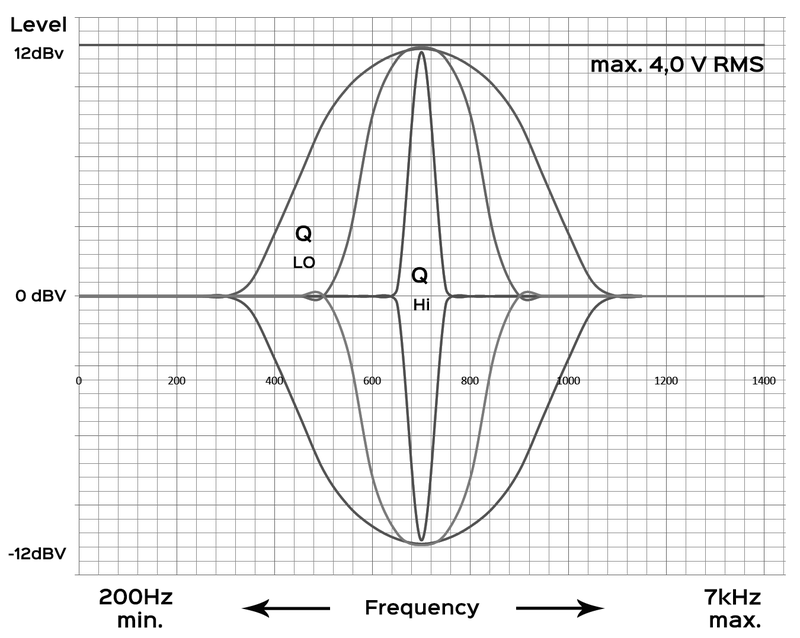 FREQ - determines the equalizer’s center frequency. Adjustment range is 200Hz to 7kHz. Power Supply : Only use a regulated 9V DC adapter with a center-negative plug, 2,1mm Barrel Connector. "Daisy Chain", unregulated power supplies and/or higher voltages may result in suboptimal noise performance and even damage your unit. No Battery. The best way is to use narrow (HI) Q’s for cut the signals, and medium to wide (LO) Q’s for boosting. If “ringing” is experienced it is usually due to high Q settings on the +FILTER side (cw.) Full boost at the high Q settings may be very dangerous for your hear and equipment. Be carefull. 500Hz – 800Hz: Cutting in this region can make the sound more pristine. Boosting will add "that" pronounced mid hump in your signal. 800Hz – 2kHz: Boosting in this region will bring out the twang. Cutting will create a rounder, less aggressive tone. Above 3kHz: Boosting in this region can add brightness and sheen. Cutting in this region can minimize noise and reduce harshness. 200Hz – 500Hz: If your bass sounds too muddy, try cutting in this region. If it needs a little warmth, try boosting in this region. 500Hz – 800Hz: Boosting in this region can add mid-range growl to your tone. Cutting in this region can make things clean and pristine. 1kHz – 3kHz: Boosting in this region can bring out attack. Cutting in this region can help create a rounder tone. Above 3kHz: Cutting can bring down the noise without much effect on the signal. Boosting can add a sense of air and space. 200Hz-400Hz: This range is primarily responsible for the boominess of your acoustic guitar. Cutting or boosting here can help with low end projection. 400Hz – 600Hz: Boosting in this range can bring out warmth. Cutting in this range can help remove mud in your sound. Above 3kHz: Boosting in this region can add brightness and a sense of air and space.